As new advancements in technology are continually developed, there is an increasing demand in the dimensional inspection industry to measure objects at the nano scale. Nano measurements are often used in determining surface characteristics in two and three dimensions. For many applications, time is of the essence, so in addition to the ability to accurately measure small objects or surface characteristics at the nano scale, doing so quickly is also important. 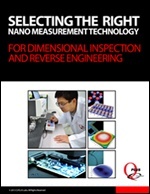 Selecting the right nano measurement device (or combination of devices) for a particular dimensional inspection or reverse engineering application requires careful consideration to ensure that you get meaningful results in the necessary time frame and within your budget. Developments in nano measurement allow for accurate and fast results for dimensional inspection and reverse engineering applications. Learn which solution is the best fit for your application by downloading this eBook today.